Over on 3 Boys and a Dog, there is a weekly Pinterest favorites link up. So, I am addicted to Pinterest. Yes, really! Right now, I have been looking for Valentine’s Day goodies on there, but the options aren’t really big. Anyway, I chose my favorite few Valentine’s Recipes and will list them below. Then, I am off to 3 Boys and a Dog to link up this post. You can come too! 7. How to Frost a Rose Cupcake in 20 seconds! Take some time to visit and repin these pins! Show some love. Don’t have a pinterest account? What is WRONG WITH YOU!? Tee Hee! Seriously, just email me and I will send you an invite. I’ve been eyeing those Valentine cinnamon rolls! Such a cute idea. I haven’t seen the candy cane lollipops and those are adorable! Such fun ideas. I think the heart shaped cinnamon rolls are my favorite. 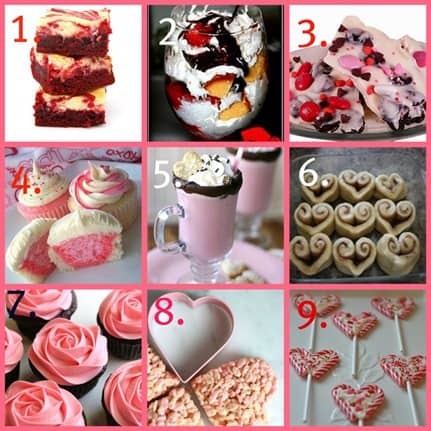 WoW, what a great collection of special treats for Valentine, I want to try them all! Hope you are having a great weekend and thank you so much for sharing your awesome recipe with Full Plate Thursday. I love this yummy ideas! Saw you linked up at Sugar & Spice. Hi Kelli – these are great pinterest finds. I can spend way too much time on that site! Thanks for inviting me to join your Valentine’s Day linky party! !